This entry was posted in Racing on May 30, 2013 by Steve Tilford. Just got the call from K-State Vet school that Bromont is out of surgery and everything went good He didn’t have any obstruction in his throat which was a relief. He has to stay at the Vet hospital for a couple more days to make sure he can eat correctly and not aspirate anything into his lungs. Okay, storms are clearing here in Kansas for a couple hours. Gonna go out and ride a bit. Stressful morning. Bromont and Ken Harkin. 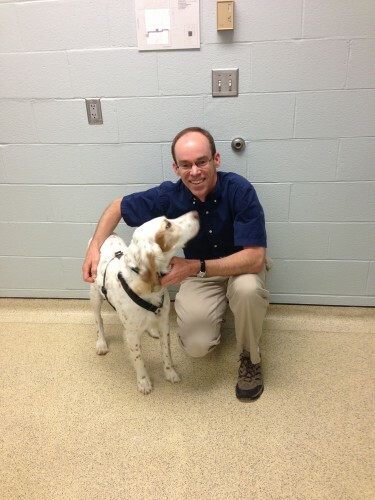 Ken has been very instrumental in taking care of all our sick dogs. He went to Vet school at Iowa State and used to ride with me back in the early 80’s when I rode for Levi’s/Raleigh. It is one of the best relationship happen-stances that has occurred to me from riding bicycles. Marsha and I met Ken in the late 80s while at Iowa State. When we were teaching at K-State 10 years ago Dr. Harkin made house-calls to treat our yellow lab Jamie. We sure miss his expertise since leaving Kansas. Glad to hear Bromont is doing ok. I love the pictures you post of him.